Once you have entered a chat room you will see all of the members that are in the room on the right side of the window, also known as the 'group participant list'. The person who is speaking always shows on the top of the list in the 'talking now' area. Next are the people who are streaming their web cam video to the group. After them we find those who are 'chatting' in text. 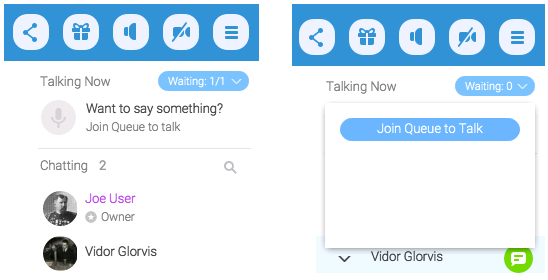 The folks chatting in text can also be 'waiting' (top right) in line to speak. 'Waiting' is the same as 'raising your hand' if you are familiar with our old 'classic' messenger. Next, you would find users that are 'restricted'. Restrictions can be placed on guests by the 'admin' of the room. You can identify the 'admins' by the gray logo beneath their name in the participant list. 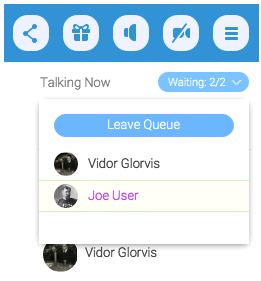 If you would like to see who in line to speak (who has their hand raised), or want to get in line yourself, click on the ‘waiting’ button near the top right of the chat room window. Now you will see the list of people with their 'hands up' waiting to speak. If you want to 'pin' the list to the top so you can always see it, click on the 'pin' icon at the bottom of the list. 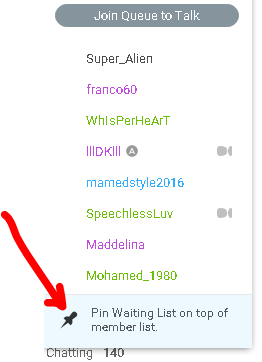 If you want to 'get in line', click on the ‘join queue to talk’ button on the waiting list window. Your name will be added to the list, and you will be shown as ‘next up’ just before it is your turn to speak. If you change your mind or no longer wish to wait, you can leave the waiting list by clicking on the ‘waiting’ button again, and then clicking the ‘leave queue’ button.